← Day 2 Plyometrics….The Mother! Today marked Day 3 – Round 2 P90x for me. I was looking forward to today’s workout and I was bored at work so I skipped out early and headed home to take care of business…..Shoulders and Arms….gotta love working those “Glamour Muscles” and with tank top season coming lord only knows I can use the work…yikes! There is honestly not a single move in this workout that I don’t like. My absolute favorite exercise is the Side-Tri-Rise that they do at the end in the bonus round. I LOVE LOVE LOVE that I can keep up with them even when they get all wacky and race each other. I tend to be a competitive person so maybe that’s why…who knows?! Today’s workout was interesting though as a thunderstorm was rolling in. As I was working out things got dark and I noticed the lightning start. Shortly after a huge crash of thunder rang out and my house literally shook which scared me. Apparently it scared my son as well cause he came busting through my bedroom door and nearly tackled me as I was doing Crouching Cohen Curls. He then looked at the screen and immediately grabbed his 2lbs weights and joined in. He’s 5 and already has a love for Tony! 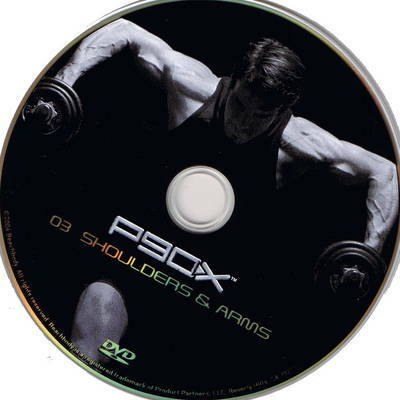 After Shoulders and Arms is usually Ab Ripper X….now I have done a full round of P90X and STILL struggle with some of the moves here. Part of my issue is my lower back and some is just my lack of core strength despite working out as long as I have. So, instead I have been opting for the Ab Ripper 200 from the Power 90 series which came before P9oX. I find that I get an amazing ab workout from it. I feel it in my abs as opposed to my thighs and lower back like I do with most of Ab Ripper X. I also REALLY like the 10 Min Trainer Ab workout. I love that there are a lot of plank style moves in it – keeps things fresh and new. After doing both workouts I was still feeling good SO….I decided to do the 10 Min Trainer Yoga which has quickly become another favorite of mine. If you have never tried 10 Min Trainer I highly recommend it! Tomorrow should be interesting. I had to go to work tonight after my workouts and stupidly had some coffee from Starbucks with my coworkers. Now it is 1:44am and I am wide awake! I have to be back at work in the morning. Maybe I should just do my workout now….hmmmmmmm.